Tribal organisations take out torchlight rally in Kokrajhar opposing ST status to six communities in Assam. Image: Northeast Now. 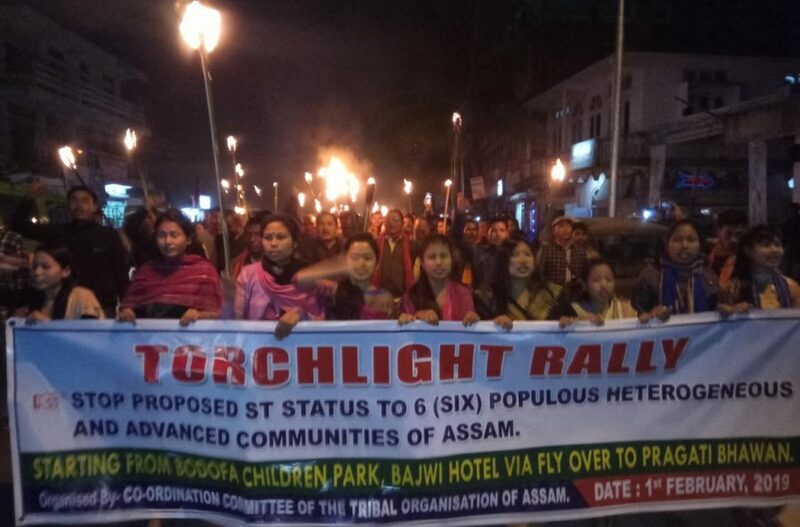 Several tribal organizations in the state took out a torchlight rally in Kokrajhar under the aegis of Coordination Committee of the Tribal Organisations of Assam (CCTOA) against the state and central government move to grant Scheduled Tribe (ST) status to six populous and advanced communities of Assam. The tribal organisations demanded withdrawal of ‘The Constitution (Scheduled Tribes’ Order (Amendment) Bill 2019’ from Rajya Sabha in order to safeguard the constitutional rights of Scheduled Tribes of Assam in particular and India in general. It also demands that instead of granting ST status to six OBC communities, they should be provided with appropriate and adequate governmental support within their own reservation quota. The tribal organisations opined that the original and existing 14 scheduled tribes will not have representation in the panchayati raj institutions, urban bodies, municipalities, state assembly and in Indian Parliament if the six advanced and populous communities are given the ST status.